The Smithsonian American Art Museum, the nation’s first collection of American art, is an unparalleled record of the American experience. The museum is dedicated to expressing the boundless imagination of the American people and exploring the American experience and global connections as told through the vision of its artists. The Smithsonian American Art Museum is the home to one of the largest and most inclusive collections of American art in the world. Its artworks reveal America’s rich artistic and cultural history from the colonial period to today. More than 7,000 artists are represented in the collection, including major masters such as Gilbert Stuart, Winslow Homer, John Singer Sargent, Mary Cassatt, Georgia O’Keeffe, Edward Hopper, Joseph Cornell, Jacob Lawrence, Bill Traylor, Helen Frankenthaler, Romare Bearden, Christo and Jeanne-Claude, Carmen Herrera, David Hockney, Jenny Holzer, Lee Friedlander, Roy Lichtenstein, Kerry James Marshall, Nam June Paik, Alex Prager, Irving Penn, Martin Puryear, Robert Rauschenberg and Bill Viola. The museum has been a leader in identifying and collecting significant aspects of American visual culture, including photography, modern folk and self-taught art, African American art, Latino art and video games. It has the largest collection of New Deal art and exceptional collections of contemporary craft, American impressionist paintings and masterpieces from the Gilded Age. The Renwick Gallery is the museum’s branch for contemporary craft, showcasing the work of artists exploring traditional and innovative approaches to making. Since reopening in November 2015 following a two-year renovation, the Renwick has pointed to new directions in the field of craft with a revitalized program that combines tradition with contemporary design and programming. The inaugural exhibition “WONDER” attracted more than 732,000 visitors in its eight-month run and created a sensation on social media. A rotating display of artworks from the 1930s through today in a variety of media are on view in the permanent collection galleries, including works by Wendell Castle, John Grade, Karen LaMonte, Albert Paley, Judith Schaechter, Akio Takamori and Leo Villareal, and the Bettie Rubenstein Grand Salon features immersive installations. The museum’s programs are contained in two National Historic Landmark buildings. Its main building is located in the heart of Washington, D.C.’s downtown cultural district. Begun in 1836 and completed in 1868, it is one of the oldest public buildings constructed in early Washington and is considered one of the finest examples of Greek Revival architecture in the United States. A major renovation (2000–2006) revealed the full magnificence of the building’s architectural features and allowed for expanded permanent-collection galleries and innovative public spaces—a conservation center, a visible art storage and community center, an enclosed courtyard, an auditorium and an education center. The Renwick Gallery is located steps from the White House in historic federal Washington. The Second Empire-style building is named for its architect James Renwick Jr. who designed it in 1859. It opened as the first purpose-built art museum in America in 1874. It became the home of the museum’s craft and decorative arts program in 1972. A comprehensive two-year renovation (2014–2015) included completely renewed infrastructure, enhanced historic features and other upgrades to the building that make it a 21st-century destination attraction. The museum’s Lunder Conservation Center is the first art conservation facility that allows the public permanent behind-the-scenes views of the preservation work of museums. The Luce Foundation Center for American Art is a community space and the only visible art storage center in Washington, with thousands of artworks on public display. The Robert and Arlene Kogod Courtyard is a public gathering space designed by the world-renowned architectural firm Foster + Partners. 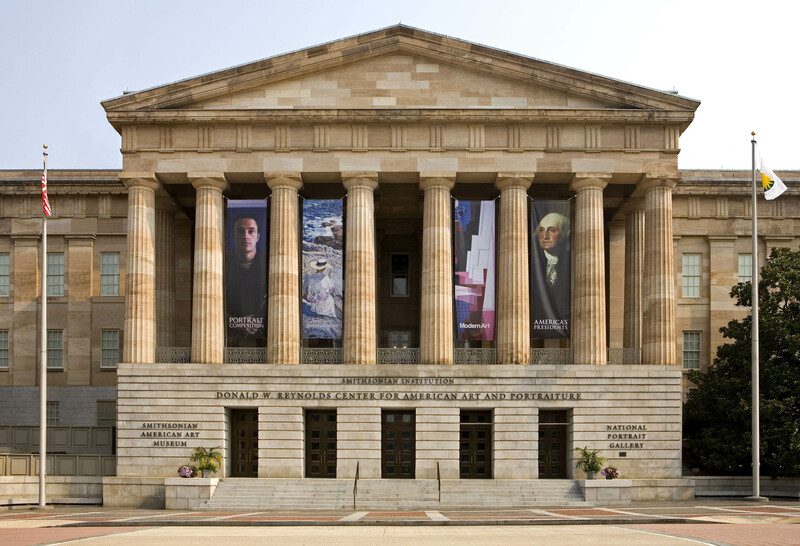 The museum shares its main building with the Smithsonian’s National Portrait Gallery; both museums share entrances at Eighth and F streets N.W. and Eighth and G streets N.W., as well as the Nan Tucker McEvoy Auditorium, the Lunder Conservation Center and the Robert and Arlene Kogod Courtyard. The museum has been engaging audiences online since 1993 when it launched one of the earliest museum websites through America Online; its stand-alone site, americanart.si.edu, was launched in 1995. It now uses an array of social media sites, including Twitter, YouTube, Tumblr, Instagram, Facebook, Flickr, iTunes U and ArtBabble to connect with online communities. In 2005, the museum debuted “EyeLevel,” the first blog at the Smithsonian. In 2016, the museum published its first virtual reality (VR) app for Apple and Android mobile devices The museum was one of the first American museums to make its entire collection available on the cloud via linked open data, and it is the lead museum for the American Art Collaborative, a consortium of 14 American museums committed to advancing scholarship and public engagement with American art through building the next generation of digital searches. The museum’s online collection and database of authoritative research now connect to a growing body of related data published by organizations worldwide, fostering new opportunities for discovery, research and collaboration. The museum has developed a significant national education program and innovative uses of technology in all aspects of the museum program. The museum is a leader in distance learning, reaching audiences far beyond the walls of the museum through real-time videoconferences that have served more than 32,000 learners in 46 states and Canada. In addition, nearly 27,000 children on U.S. military bases around the world enjoy the museum’s collections through a partnership with the Department of Defense Education Activity. The museum provides electronic resources to schools and the public through its website, including sites such as “Oh Freedom! Teaching African American Civil Rights Through American Art at the Smithsonian.” The museum offers in-depth professional development programs for educators, including weeklong national summer institutes in which teachers learn digital tools and teaching techniques for integrating art across the curriculum. Since 1970, the museum has hosted more than 640 scholars who now occupy positions in academic and cultural institutions across the United States and in Australia, Asia, the Caribbean, Europe, the Middle East and South America. The museum maintains six online art-research databases with more than a half-million records, including the Inventories of American Painting and Sculpture that document more than 400,000 artworks in public and private collections worldwide and extensive photographic collections documenting American art and artists. An active publications program of books, catalogs and the critically acclaimed peer-reviewed journal for new scholarship American Art complements the museum’s exhibitions and educational programs. Last year, the museum surpassed its campaign goals for both financial gifts and significant art gifts, a combined total of $105 million, with more than one year remaining in the campaign. The $65 million cash goal was exceeded by $3 million, with approximately one-third going to support the renovation of the museum’s historic Renwick Gallery and the addition of a state-of-the-art education center in the museum’s National Historic Landmark building, and another third enhancing the museum’s endowments. The campaign will continue through 2017 with a focus on additional artworks and endowments to support curatorial, technology and education initiatives. 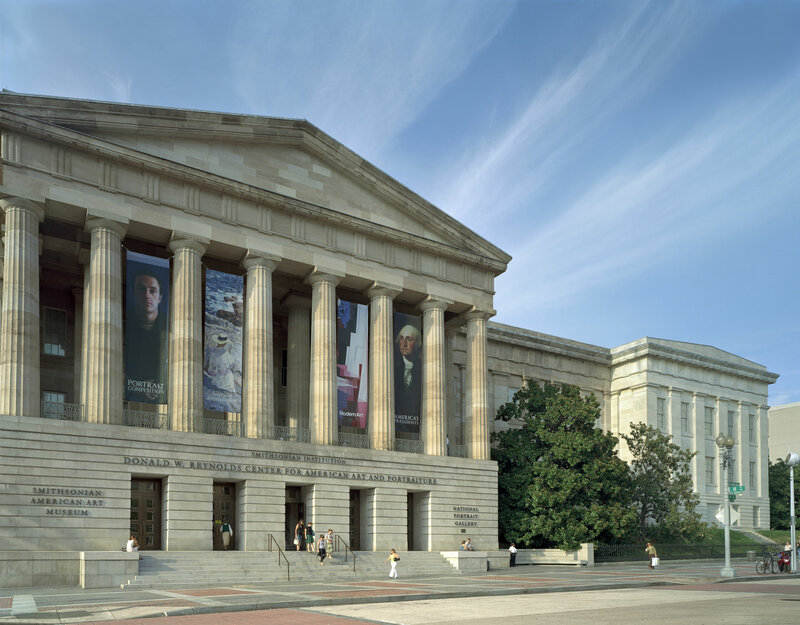 The Smithsonian American Art Museum’s main building is located at Eighth and F streets N.W. above the Gallery Place/Chinatown Metrorail station. Hours are 11:30 a.m. to 7 p.m. daily (closed Dec. 25). Admission is free. Its Renwick Gallery, located on Pennsylvania Avenue at 17th Street N.W., is open daily from 10 a.m. to 5:30 p.m. (closed Dec. 25). Admission is free. Follow the museum on Twitter, YouTube, Tumblr, Instagram, Facebook, Flickr, Pinterest, iTunes U and ArtBabble. Museum information (recorded): (202) 633-7970. Smithsonian Information: (202) 633-1000. Website: americanart.si.edu. Note to editors: Selected high-resolution images for publicity only may be downloaded from americanart.si.edu/pr. Email americanartpressoffice@si.edu for the password. 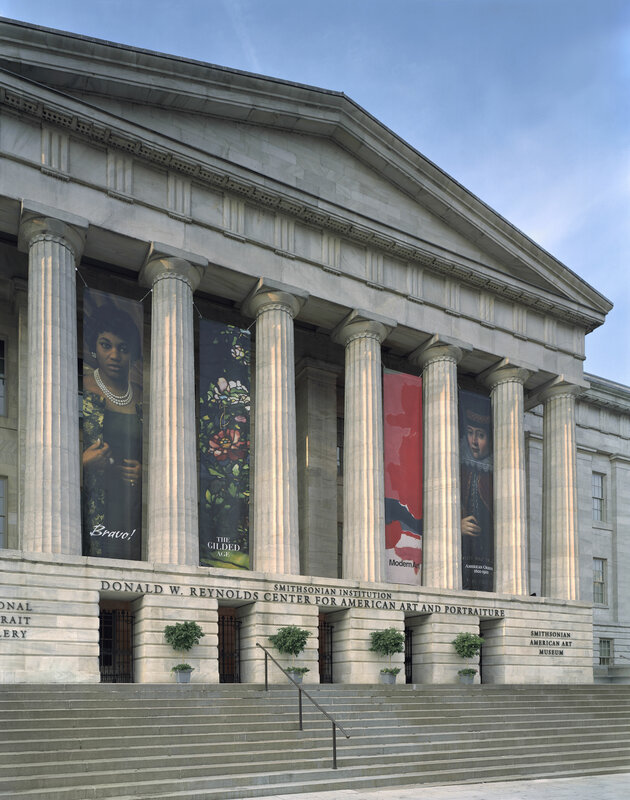 The Donald W. Reynolds Center for American Art and Portraiture, home to the Smithsonian American Art Museum and the National Portrait Gallery in Washington, D.C. Exterior of the Donald W. Reynolds Center for American Art and Portraiture in Washington, D.C., home to the Smithsonian's National Portrait Gallery and the Smithsonian American Art Museum.